What Kinds of Wrist Injuries are Possible? A sprain is an injury to the wrist ligaments without any evidence of bone injury (that is, no broken bones or cracks in the bone). A strain is where there is a tearing of the muscle fibers in the area surrounding the wrist. With a sprain, there is usually only a partial tearing of the ligaments. In a severe wrist sprain, there can be a complete tear. The doctor will ask what happened. Sometimes the way you fell (the mechanism of injury) tells what type of injuries to look for. After taking a history, the doctor will examine the entire arm from the shoulder to the fingers. This is done to make sure there are no other injured areas. The doctor will also check to see how well the blood is flowing into the fingers and make sure there is no numbness in your hand. When examining around the wrist, the doctor will gently push on the wrist to determine where there is tenderness. A special area that will be examined is called the anatomical snuffbox. This is the area that is indented on the thumb side of the wrist when you stick your thumb up as if to hitchhike. Tenderness there is of special importance because the bone under that spot (the scaphoid) is the most common carpal bone that is fractured and often does not look fractured on the initial X-rays. 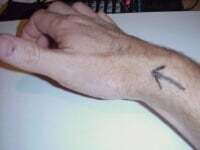 X-rays of the wrist or forearm or both may be taken. When you have fallen and injured your wrist, it is important to rest your arm. If there is an obvious deformity of the wrist or numbness in the hand, you should lay your wrist across a soft pillow and seek medical attention immediately. If there is no obvious deformity and you are not in severe pain, you may want to take some acetaminophen (such as Tylenol) or ibuprofen (Advil) and wait to see how the wrist feels. Again, a soft pillow is a good temporary splint. Apply ice to the area. Do not put ice directly on your skin. You can wrap a bag of frozen vegetables in a towel to create an icepack. If pain or other symptoms do not go away within a day, you should see a doctor. If there is no fracture seen on the X-ray, the doctor may diagnose a sprain. 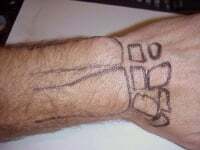 In cases where there is tenderness in the anatomical snuffbox, the doctor may also suspect there may be a fracture of the scaphoid that is not apparent on the X-rays. For a wrist sprain, the doctor may decide to treat you with no splint, a Velcro wrist splint, or plaster splint (like a cast). The decision about a splint will be based on your level of pain, amount of swelling, restriction of movement, and concern about an occult or hidden fracture. (An occult fracture is a fracture that is so small that it does not appear on the initial X-rays.) If the doctor has concerns about an occult fracture, the doctor may splint you and advise you to have repeat X-rays at your doctor's office or with an orthopedist (bone specialist) in 5-10 days. For minor sprains, you will likely not be given a splint and told to limit activity appropriate to your level of pain. For more severe sprains, you will likely be given a Velcro wrist splint that you can take on and off. Also you might be prescribed some form of pain medication. You should make sure that you let the doctor know what other medications you are taking and any allergies that you have. Most experts recommend only the use of ice or cold therapy for sprains. Some doctors may still recommend switching to heat therapy after 24-48 hours. Treatment of a fracture (a broken bone) depends on the specific type of fracture found. If you have a fracture, you may be treated by the doctor who sees you initially or you may be referred to an orthopedic surgeon. Follow the doctor's instructions. Most of the time you should follow up if you are not completely better in three to five days, or sooner if you become worse or problems develop. Follow the doctor's instructions. Most of the time you should follow up with your health care provider if you are not completely better in three to five days, sooner if you become worse or problems develop. Most wrist sprains should be better in three to five days. If you have symptoms that last beyond five days, you should see your doctor for reevaluation. The outcome of a fracture depends on the type of fracture. Ask your doctor about what to expect for your type of fracture. Wrist injuries, whether a sprain or a bone fracture, can be painful. As a patient heals, it's important to maintain a range of motion in the wrist. That's why physical therapists and doctors alike recommend several types of wrist rehabilitation exercises patients can perform as they heal from a wrist injury. But remember, with any type of rehabilitation, talk to your doctor first about which exercises are best for you. "Evaluation of the adult with acute wrist pain. UpToDate. Last reviewed: Jun 2018"
What was the cause of your wrist injury?